This resource features the general description of a river city called Angelus. The city was occupied by hostile forces for years and has only just recently been taken back. 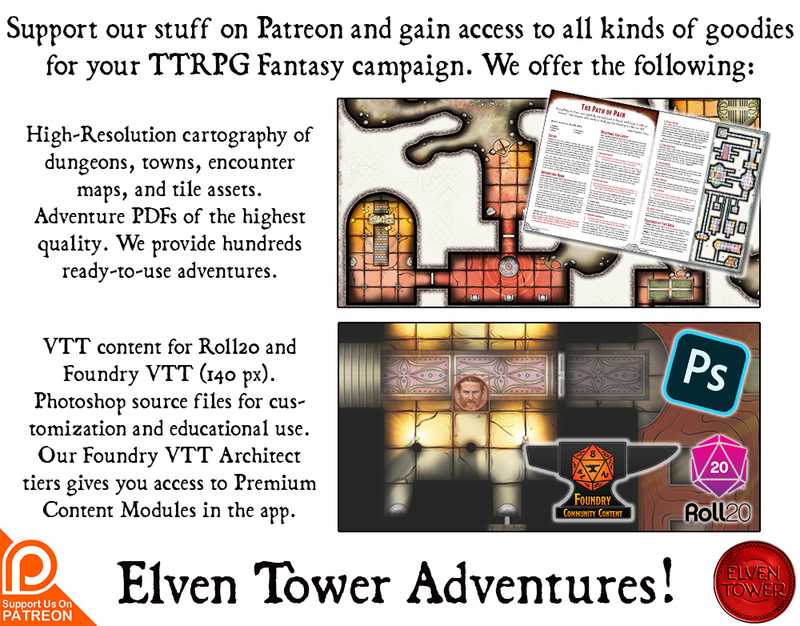 It includes adventure ideas that are appropriate for low-level (Levels 1 to 5) adventuring parties. Challenge Rating (CR) is calculated using a party of four as the model. Angelus, people used to call it the Bastion of the West. But nowadays it falls short of its name. Six years ago, Angelus was a marvelous city. It was the biggest settlement in the province. Everyone came to sell, buy, barter, or eat. Angelus is located right on the Silver River. The Harbor District used to be one of the busiest places in the kingdom. Barges and transport boats came from upriver with spices, exotic perfumes, wool, and silk. Wealthy merchants meandered the docks in search of equally wealthy noble buyers. They would eventually continue on their way south with their ships loaded with Angelus’ main exports: worked leather, steel weapons, and corn and barley from nearby farming settlements. It all changed when the orc chieftain Taharen Tusk amassed the biggest horde of orcs and goblinoids in the western provinces. When it happened, it was so fast that no one really knew where all those creatures came from. Some say Taharen Tusk rallied most of his numbers from Underdark settlements. Regardless of the truth, Chieftain Tusk hit the western province with the strength of a sledgehammer. Their main target was to bring down the up to then impregnable Bastion of the West, Angelus. The great city was not able to prepare in time for a siege. They expected to be cut off for months. In a turn of events, Chieftain Tusk ordered his forces to attack after a week-long siege. They stormed the walls at dawn. While they lost a sizable chunk of their forces, Angelus fell that morning. Before nightfall, the city was on fire. Thousands of innocent people were either prisoner of the cruel orcs, dead by their hands, or homeless after abandoning their home. 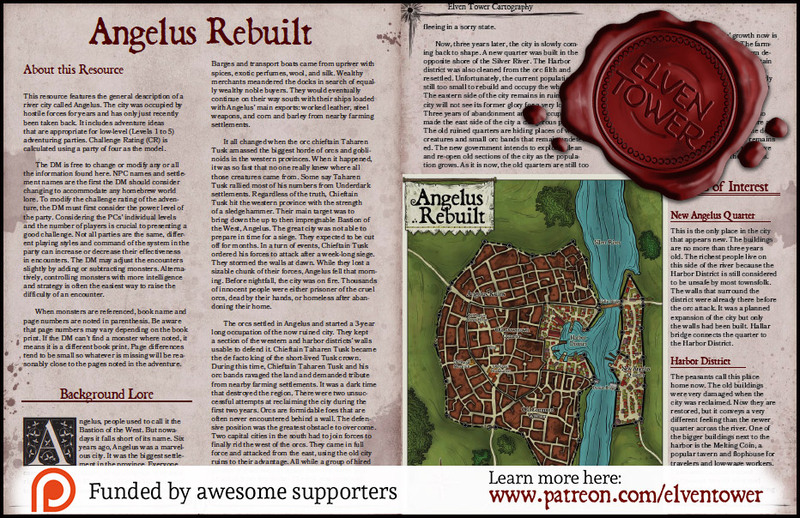 The orcs settled in Angelus and started a 3-year long occupation of the now ruined city. They kept a section of the western and harbor districts’ walls usable to defend it. Chieftain Taharen Tusk became the de facto king of the short-lived Tusk crown. During this time, Chieftain Taharen Tusk and his orc bands ravaged the land and demanded tribute from nearby farming settlements. It was a dark time that destroyed the region. There were two unsuccessful attempts at reclaiming the city during the first two years. Orcs are formidable foes that are often never encountered behind a wall. The defensive position was the greatest obstacle to overcome. Two capital cities in the south had to join forces to finally rid the west of the orcs. They came in full force and attacked from the east, using the old city ruins to their advantage. All while a group of hired pirates and sellswords sailed from the north and attacked from the docks. The city was reclaimed and whatever was left of the orcs was either dead or fleeing in a sorry state. Now, three years later, the city is slowly coming back to shape. A new quarter was built in the opposite shore of the Silver River. 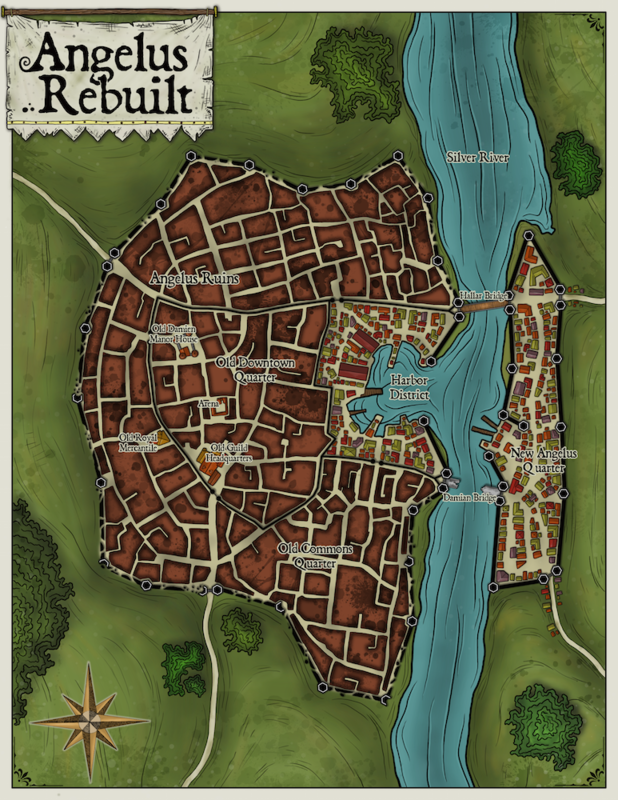 The Harbor district was also cleaned from the orc filth and resettled. Unfortunately, the current population is still too small to rebuild and occupy the whole city. The eastern side of the city remains in ruins. The city will not see its former glory for a very long time. Three years of abandonment and orc occupation made the east side of the city a dangerous place. The old ruined quarters are hiding places of wild creatures and small orc bands that remain undetected. The new government intends to explore, clean and re-open old sections of the city as the population grows. As it is now, the old quarters are still too dangerous to explore alone. The biggest challenge to Angelus’ growth now is the unfortunate state of the countryside. The farming settlements were decimated, some of them destroyed altogether. A big city has no way to sustain itself without all the small communities that surround it. The new government of Angelus is slowly sending new settlers to the old farms to revive the farms, but the process is slow. In the meanwhile, Angelus is a great place to get work for sellswords and mercenaries. There are still small orc bands scouring the land and the defenseless farming settlements. The old city remains a dangerous place to explore and strong men have an easy time earning a coin or two in the process. This is the only place in the city that appears new. The buildings are no more than three years old. The richest people live on this side of the river because the Harbor District is still considered to be unsafe by most townsfolk. The walls that surround the district were already there before the orc attack. It was a planned expansion of the city but only the walls had been built. Hallar bridge connects the quarter to the Harbor District. The peasants call this place home now. The old buildings were very damaged when the city was reclaimed. Now they are restored, but it conveys a very different feeling than the newer quarter across the river. One of the bigger buildings next to the harbor is the Melting Coin, a popular tavern and flophouse for travelers and low-wage workers. The owner, a man named Tardannus, is well informed about odd jobs for people willing to risk their lives. He used to be a soldier and participated in the reclaiming of Angelus. While this section of the city is more or less safe, from time to time a creature or group of them climb the wall and attacks the district. The usual culprits are bands of Orcs (MM, page 246), Goblins (MM, page 166), or wildlife. This used to be the biggest section of the city. It surrounds the Old Downtown Quarter. The common folk and the poor lived in this section of the city, the closest to the outer wall and the farthest from the harbor. This is the part of the city that is most dangerous. The buildings are in shambles. Most of them will require being demolished before building something new. There is a rumor about the Royal Mercantile (in the map) building. It belonged to one of the wealthiest merchant families in the region and should be in a very bad state. But people gossip about a hidden basement where the merchants hid their riches in a strong safe. No one knows if the safe is real or if it has already been sacked but the rumor is worthy of investigation. Unknown to all, the building and its basement is now the lair of two wild Displacement Beasts (MM, page 81). This section of the city used to be the richest quarter. The nobles, wealthy merchants, and important military officers lived here. The place features a great number of buildings and small alleys. It is well known that bands of orcs still call this place home, waiting for a moment of surprise to take revenge. Patrols explore the place from time to time and kill whatever orc or goblin they see, but there seems to be no end to them. When the city’s population rises, this is the first area to sweep and clean before occupation. The Old Guild Headquarters used to be a place for the different trade guilds to commerce. The great building conglomerate is now in shambles. Some people whisper about the riches that are hidden there, especially because the jeweler’s and the goldsmith’s guild had an office there. Unfortunately, no one has been able to explore the place because it is now the lair of a Wyvern (MM, page 303) that built its nest/lair two days ago in the second floor of the guild’s headquarters. No one dares approach the building now. The old Arena is still in good shape. It never stopped featuring fights and events, even during the orc occupation. The orcs used the arena and held fighting events every other week for entertainment. Their favorite event was to pit an unarmed man against a fully armored Orc (MM, page 246) warrior. The Old Damien Manor House is located in the northwest section of the Downtown Quarter. It used to be the residence of the city’s appointed lord. Now, it is a ruin. After the orcs took the city six years ago, they destroyed the building of the man lord that had decimated their bands so many times before. Lord Damien lost his life that day. There is a secret cellar under the ruined manor house that no patrol has found yet. Inside, Chieftain Taharen Tusk (MM, page 246) hides, gathering as many orcs and goblins to his side. He refuses to give up the city. No man in Angelus is aware that Chieftain Taharen is still alive. No one ever found his body but wars are messy so they just thought he was dead. He schemes his revenge.